Bob Schelstraete has passed along the sad news that his father, Albert Schelstraete-Coulier passed away earlier today at University Hospital in London, Ontario. He was 92. 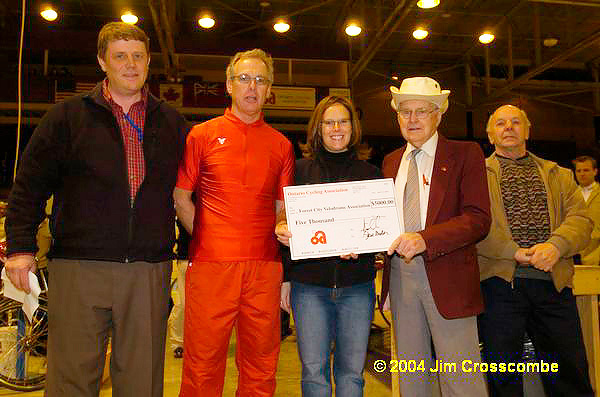 Albert was most recently known for his involvement in the Forest City Velodrome, where he was both the track designer and a ferverent support of the program. However, his palmares in the sport go back to the mid-1930s, when he rode his first bike race. 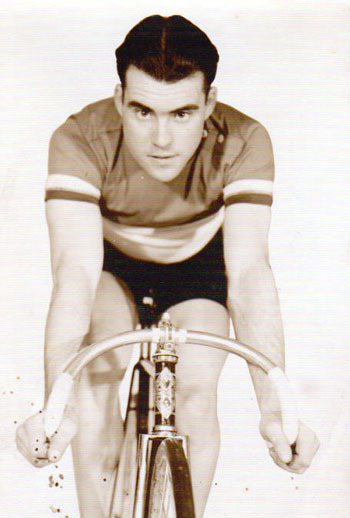 Despite being hit by a truck when training and breaking both legs (at the age of 19), he came back to racing and won a number of significant races, including the Montreal Six Day as an amateur, before turning professional in 1940. He was named Outstanding Canadian Rider in 1940. His career ended in 1942 with World War II. After his 'retirement', Albert continued to ride and race, competing in numerous Masters World Championships, World Senior Games and endurance events (he won the Detriot 24 Hour in 1982, at the age of 63). However, Albert's involvement in the sport went well beyond racing. He built and designed dozens of tracks around the world, including the one used for the 1976 Olympics in Montreal. He was the President of the Canadian Wheelman's Association (predecessor to the Canadian Cycling Association) for 1955-57. On a personal note, Albert showed a life long passion for our sport, and often dropped by our offices to chat about the state of the sport, historical events, upcoming events, and projects he was involved with. We shall miss him greatly, and offer our condolences to his family. Here is a history of Albert's life long involvement in cycling. Albert Schelstraete-Coulier of Tillsonburg born Nov 15, 1918 crossed his final finish line at University Hospital London on March 14, 2011. He is predeceased by wife Irene (2003), daughter Marianne (1944) and great-granddaughter Abby (2002). Survived by sons Robert (Elaine) Schelstraete and Ronald (Linda) Schelstraete, Grandchildren Karen Demaree (Brian), Lynn Cristino (Hersh), Joann Schelstraete-Colyer (Vince) and Vicki Schelstraete-DeFilippo (Julius). Also 7 great-grandchildren. Albert's life-long passion was cycling where he competed internationally as both amateur and professional. He founded the Silver Spokes Cycling Club. He spent many years designing and building cycling velodromes across North America including World Championship and Olympic tracks. His latest endeavour was co-founder of London's Forest City Velodrome. Visitation on Wednesday 2-4 pm and 7-9 pm and service on Thursday at 11:00 am at Verhoeve Funeral Home 262 Broadway St., Tillsonburg, On N4G 4J1. Cremation to follow at a later date. In lieu of flowers donations to charity of your choice or Forest City Velodrome youth cycling would be appreciated.